There are animals and then there are animals, even in Venice. You can find little to big species of fish, mammals and birds that populate the island and its lagoon. We’ve already gone over and spoken of some of these in our articles. But there are and though it may be a challenge to find them- many other animals, exotic ones by nature, that find a place in unexpected areas of the city. There isn’t a zoo or a biopark on this century-old island, yet in the past it wasn’t uncommon to see a few as an amusement for noble Venetians. As always leave it to art to add beauty to the historical and architectural marvels of the city in all its forms. From Sculptures that immortalize the Serenissima symbols to contemporary art installations everything. Jungle, savanna and desert animals can be found in alleys and squares throughout the city. There’s nothing left to do than go hunting for them (ammunition includes a keen eye and a dose of bewilderment) in this unexpected and peaceful fauna located in Venice. 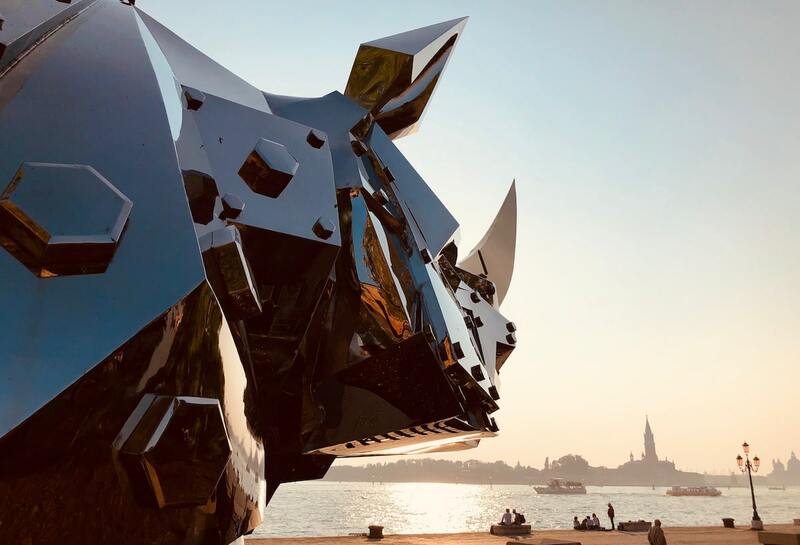 It dominates the San Marco basin and isn’t hard to find the “King Kong Rhino” by Li-Jen Shih- was installed for the Architectural Biennale of 2018. The large rhinoceros “hero survivor” is an enormous steel sculpture of 8 meters in height and 4 meters in length on display at the Marinaressa Gardens. It is a big gentle giant in size, symbolic value and great beauty. Bringing up Lions in Venice is an easy reference: in fact it is the symbol of the Serenissima City. The feline symbol can be found in all different forms and dimensions all over the city. One of the most celebrated and iconic representations is the one seen on the Column in Piazza San Marco (the other column is reserved for San Todaro) that represents the Evangelist Saint Mark in the traditional lion form.